Students at Tytherington Sixth Form follow a two-year programme of study incorporating three A Levels or A level equivalent courses. 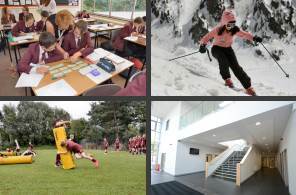 There are three pathways of study at Post-16, designed to guide students to embark on appropriate courses in line with their performance at GCSE. Pathway 1 For students whose GCSE results are mainly grade 6 and above The full range of courses is open to students on Pathway 1, though students in this group would normally choose to study 3 A levels. NB. Students who achieve mainly grade 8 and 9 at GCSE can choose to do 4 A levels. Pathway 2 For students whose GCSE results are mainly grade 5 and above Students on Pathway 2 would normally choose a combination of A level and BTEC / Level 3 Extended Certificate Courses. (An A level only route is possible depending on the entry requirements for the subjects chosen). Pathway 3 For students whose GCSE grades are mainly 4 and above Students on Pathway 3 will normally choose 3 BTEC / Level 3 Extended Certificate Courses. Through a series of one-to-one discussions with a member of the Sixth Form team, applicants can be assured that they will be supported in choosing a suitable study programme. Students wishing to study A Level courses must normally achieve a minimum of 5 Grade 5s at GCSE. Students wishing to study mainly BTEC / Level 3 Extended Certificate courses must normally achieve a minimum of 5 grade 4s at GCSE. Students who achieve below grade 4 in English and Mathematics will have to re-sit the examination in Year 12. Students who achieve grade 4 will be given the opportunity to re-sit the examination in Year 12 in order to achieve a grade 5. Below is the list of entry criteria for each course. More detail on each course can be found in this booklet. NB. You will notice from the list below that AS Further Mathematics is an additional option for interested students to take alongside their three A levels in Year 12. AQA Level 3 Extended Certificate in Applied Science Grade 5 in Separate Sciences, or 5-5 in Trilogy Science at GCSE (4 or 4-4 will be considered). A Level Psychology Grade 5 at GCSE, if taken. NB. All courses are subject to demand. Parents and students will be kept informed of any changes. All applications will be considered at individual student level.